I’ve just finished proofing my scurrilous memoir about my career in the British film industry. This is the rough of the cover (I’ve now seen the final version, but don’t have a copy of it). Most books about British films are rather earnest about popular cinema, and rarely link the experience to the times. I wanted to counteract that, but also to explore something I’d glimpsed in ‘Paperboy’ – the way in which British film, particularly comedies, were linked to class. ‘It’s the late 1970s and twenty-something Christopher is a film freak, obsessively watching lousy films in run-down fleapit cinemas. He longs to become a famous screenwriter and put his dreams on the big screen, and so heads for Wardour Street, Britain’s equivalent of Hollywood, with an armful of terrible scripts. But he’s made a spectacular mistake. He arrives just as the nation’s filmmakers fall to their knees, brought low by the arrival of video and the destruction of the old movie palaces. The only films being made are smutty low budget farces and TV spinoffs. 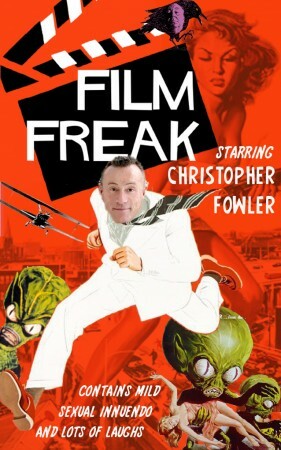 Instead of being asked to write another ‘Bullitt’, Chris finds himself churning out short films for boilers and nylon sheets. Somehow, against the odds, he finds success – although in a very different guise to the one he expected. If you liked ‘Paperboy’ or simply enjoy reading weird stuff about movies and the seventies in general, you may also get pleasure from this. Really looking forward to it as it’s about time there was a realistic memoir of those times. Because all that ‘weird stuff’ of 70s cinema wasn’t weird, it was the life sustaining magic that made such a lasting impression and kept us going back again and again. Bookshelf space already been made available. Did you get the invasion of Asian martial arts movies that dominated all of Times Square at one point in the 1970s? I wondered if that was just an American or even just Times Square phenomenon. I have it on pre-order and have done for some time, nice to finally see how it will look. If it is half as good as Paperboy then I shall really enjoy it. BTW I loved the Soho Devil story maybe you could write a version for the Kindle as much as I liked the graphic novel It wasn’t as submersive as a proper book. Mike, we had Verina Glaessner (possibly spelled wrong) at Time Out championing Asian movies during that period so we enjoyed every SMASH BANG GRUNT thst you did! Just like Stalky said, my copy of ‘Paperboy’ is now waiting for this one to come along! I have just finished Paperboy and am looking forward to this immensely! Aren’t You Rather Young To Be Writing Your Memoirs?